Gellan Gum is a gelling agent developed specifically for applications where other gelling agents like agar agar and gelatin are not ideal. 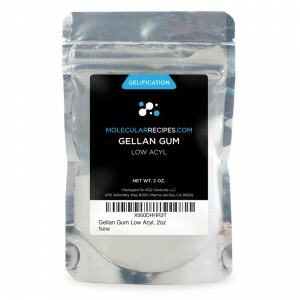 There are two types of Gellan Gum: gels made with Low-Acyl Gellan Gum tend to be brittle and firm, while gels made with High-Acyl Gellan Gum are flexible and elastic. The two types also vary slightly in other ways, and there is some additional variability in technical characteristics across various brands. The two types may be mixed together to form unique textures. Gellan is well-known for its use in fluid gels and can also be used for spherification. Gellan is relatively unique in molecular gastronomy because it is a highly-engineered ingredient that has only been applied to the food industry from the early 1990s. Gellan is created by the bacteria Pseudomonas elodea or Sphingomonas elodea. It was first discovered in the labs of Merck and Co., under the Kelco division, in 1978. It was approved for food use in 1992 by the US FDA. Today, C.P. Kelco continues to market the product under a variety of brand names. Technically, Gellan is a microbial exopolysaccharide, though all this really means is that it is secreted by a microbe (a bacterium) and is a polysaccharide, or a long chain of carbohydrate-based molecules, similar to flour or starch. Gellan gum is gaining traction in the food industry as a replacement for other hydrocolloids and in biological research as a replacement for Agar. As a general rule of thumb, you can think of using Gellan as a substitute for agar. The difference between the two is that Gellan can withstand higher temperatures and produces the same viscosity at half the concentration of Agar. Both high-acyl Gellan and low-acyl Gellan can be used for gelling, thickening, and stabilization, much as other hydrocolloids can. Its special qualities relate to the particular temperatures it can withstand and the mouthfeel it imparts. Gellan is most often used in molecular gastronomy to create unique textures that can be served hot and to create a variety of fluid gel textures. Saffron Tagliatelle of Consomme, is a creation of molecular gastronomy Chef Ferran Adria and his El Bulli team. It consists of noodle created from unsalted chicken or vegetable broth. The low-acyl Gellan used in this recipe lets the noodles stay clear and gives an elastic chew. The picture below shows the Tagliatelle. When we said that Gellan can withstand high temperatures, we weren't kidding. 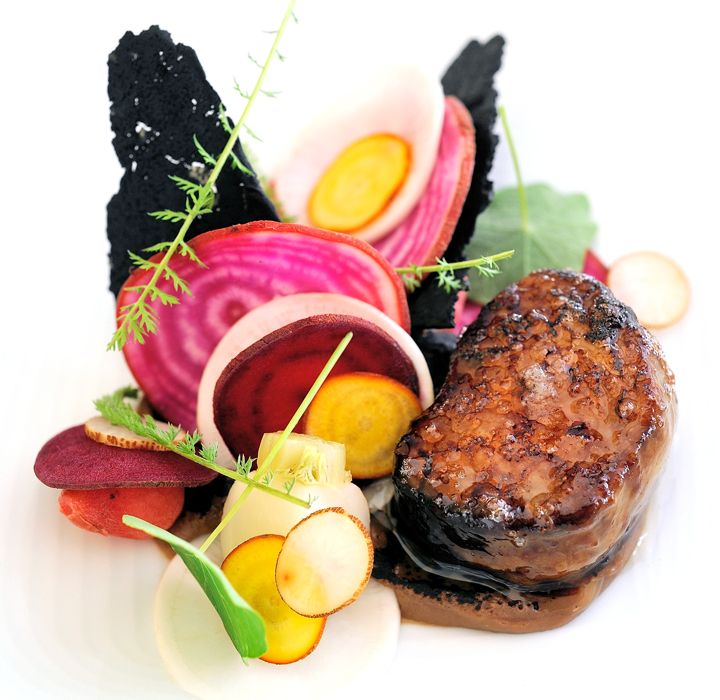 In this recipe for Eel and Bone Marrow, Eggplant, and Pickled Vegetables by Chef Dan Hunter of Royal Mail Restaurant in Dunkeld, Australia, Gellan is used to create an eggplant puree that is then torched prior to service. Picture below. The recipe shown above uses gellan to create a fluid gel. A fluid gel is simply a gel that is blended after it has already set. With some hydrocolloids, if you blend a gel after it has already set, it reverts to a liquid. Gellan gels will not turn into liquids, but will still be malleable after blending. 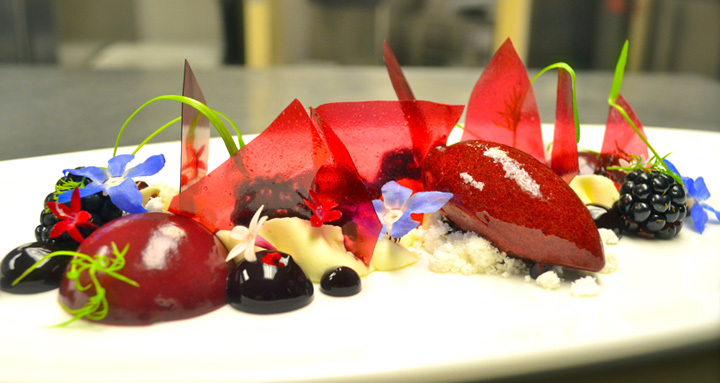 In the below example, Blackberry in Textures by Chef Russell Karath, Gellan is combined with blackberry puree, allowed to set, then blended to create a fluid gel that can be spooned beautifully for final presentation. It's important to note here that the sources we used for some of the numbers below were often contradictory on the exact properties of Gellan. This is most likely due to the variability in products that are labeled Gellan and have been specifically engineered for certain properties. Know that your particular use of Gellan may not follow these parameters exactly. The reason the temperatures vary is because the exact temperature will depend on concentration of Gellan used. Texture: Low-acyl Gellan is generally considered brittle while high-acyl Gellan is more elastic. It is possible to combine the two to create the exact desired texture. Appearance: High-acyl Gellan is opaque, low-acyl Gellan is clear. Flavor release: Good, for both varieties. Mouthfeel: Both have a clean mouthfeel; low-acyl Gellan has been described as "creamy" as well. Freeze / Thaw stable: High-acyl Gellan is freeze/thaw stable. Low-acyl Gellan is not. PH Tolerance: Stable between 3.0 and 10.0 pH. Other Tolerances: High-acyl Gellan will tolerate up to 50% alcohol. Synergies with other ingredients: The gelling of low-acyl Gellan is promoted by calcium, magnesium, sodium, and potassium ions. Concentration Range: 0.2-1.0% for most applications. Twice as viscous as Agar at equal concentrations. Dispersion: Gellan will disperse in cold water, but dispersion is aided by the use of warm to hot water, sugar, alcohol, or glycerin. Hydration: Happens at around 194°F/90°C. Can be hydrated at low pH, around 3.0 or 4.0, which is unique amongst hydrocolloids. Setting: Sets rapidly at relatively warm temperatures (see above for exact numbers). Low-acyl Gellan can be used instead of sodium alginate for spherification and reverse spherification due to its sensitivity to calcium ions.